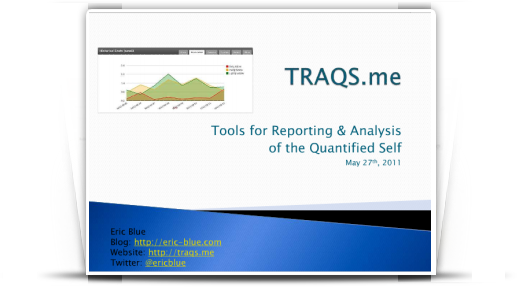 A month ago around this time I was anxiously awaiting the first annual Quantified Self conference in Mountain View, CA. This was a fantastic conference on many levels and, although a little late, deserves a future post detailing the great sessions, people, and companies who were there. I didn’t have an official speaking session, but I used this event as a milestone to make forward progress on my personal project for fitness tracking. Since last August when the project was originally envisioned, I’ve made a lot of progress on not only building this system for my own use, but also expanding on the original idea of just ‘tracking fitness’. Fitness is one significant component of improving oneself and general well-being. But, when most people think of fitness, it’s associated with simply going to the gym, running on the treadmill, or pumping iron indoors, and tracking these activities in some journal. The scope of my project has since grown to include tracking for sleep quality, detailed location tracking and geocoding, and heart rate monitoring. I’d like to eventually expand the scope further to include nutrition tracking, health metrics (blood pressure, nutrient levels/blood tests, cholesterol, etc. ), and even more subject things like mood and factors that affect emotional well-being. 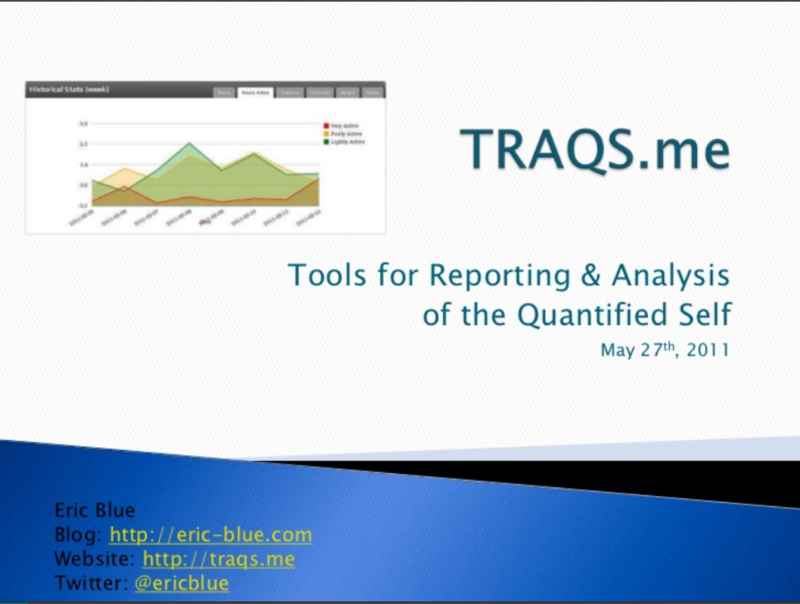 I’ve also put up a site at http://traqs.me that contains the presentation and a static demo (HTML pages) that illustrate the Dashboard, Report, and Map features. The code is still a few weeks away from getting to the point that I’m ready to distribute a binary installer, and a little further out until the code is shareable (probably on GitHub). I’m still working out what portion of the code will be released as open source (splitting out the data import, reporting/data export, and UI components), entertaining how traqs.me could be used by others as an online service, and ultimately figuring out how to license appropriately. Stay tuned for more!